Persistency Leadership - Leadership Story: The Crow And The Pitcher. Would you like to explain the value of commitment using a story? 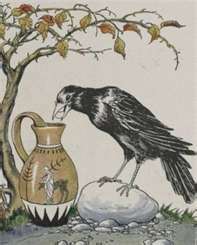 Have you heard this Aesop's Fable - The Crow and the Pitcher? It is described here and can be used as a training game. A Crow, half-dead with thirst, came upon a Pitcher which had once been full of water; but when the Crow put its beak into the mouth of the Pitcher he found that only very little water was left in it, and that he could not reach far enough down to get at it. He tried, and he tried, but at last had to give up in despair. Then a thought came to him, and he took a pebble and dropped it into the Pitcher. Then he took another pebble and dropped it into the Pitcher. Then he took another pebble and dropped that into the Pitcher. Then he took another pebble and dropped that into the Pitcher. Then he took another pebble and dropped that into the Pitcher. Then he took another pebble and dropped that into the Pitcher. Persistency Leadership - The Lesson - Commitment does the trick. If you have a vision, follow it. Consistent effort and commitment to the vision will lead to success. The Proverb: I also found a proverb with the same message, 'Many drops make an ocean'. Persistency Leadership - A real life experience. The drop or the pebble. Is all of this really true? I found it to be true in the area of losing weight. I started to walk for half an hour everyday (except Sundays). I soon discovered that I sarted to loose inches. Over a period of months these inches turned into Kilograms. I weighed 91 Kilograms in May 2007 and I had come down to 84 Kilograms in the month of August 2007 - 7 kilograms! Wow! Persistence pays ! Stories can be used effectively as training games.